We have a big tree in our front yard and usually it just provides me with fabulous sticks and branches. For some reason though, it gave us an added bonus this weekend. The winds kicked up and the lawn was covered with little pieces of tree bark. Hmmm. What to do….? 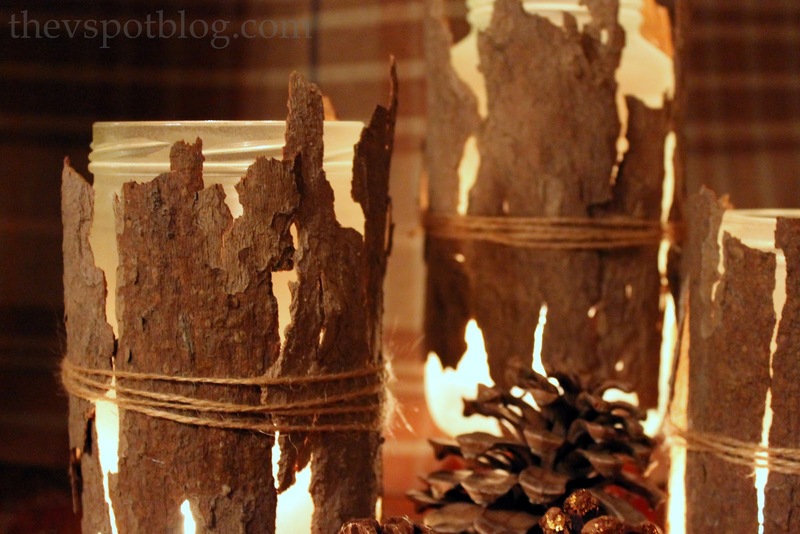 How about glue pieces to empty jars and make tree bark candle holders? I grabbed a few empty glass jars and gave them a quick shot of Rust-Oleum Frosted Glass Spray . Then I just fired up my glue gun and glued the pieces around the sides of the jars. Wrap a little twine around the middle to finish it off and you’re done. These are great grouped on a mantel, as part of a centerpiece, or incorporated in any number of ways into your fall home decor. You didnt hairspray them. Im a little disappointed. These turned out great! I have a couple of friends that will be thrilled if I make these for them! Looks like I need to head outside before the rain comes! Um. We’re on the same wave length. I made something like that with fabric leaves! I’ve never seen that spray paint before. I like the look it provides! Now I want some tree bark! Such a cute idea, Vivienne. And free… even cuter. How do you stop the bark from drying out and cracking off please? Ive got jars like these but central heating is spoiling them . Any ideas how to stop this? Hi Wendy, sorry but I don’t know what to tell you on this one. We have central heat too and it has never been an issue. Maybe try moving them if they are in direct heat?